Ubuntu Certification: We have moved! Yes, Ubuntu Certification has moved to a new address. 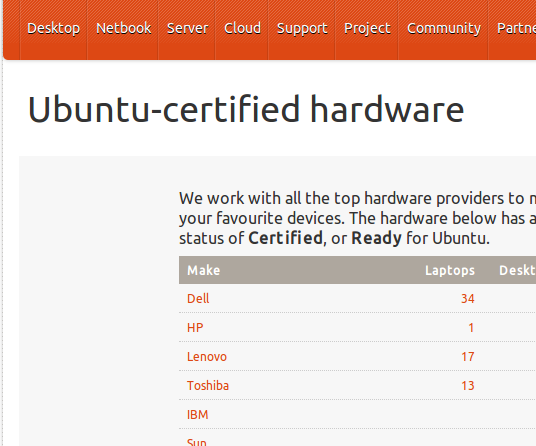 We are now at http://www.ubuntu.com/certification/. (Our previous address http://webapps.ubuntu.com/certification/ now re-directs there). But this is more than just a change of address. The change signifies an alignment of our web infrastructure that will allow us to deploy user improvements quicker than before and to share more certification data with the community. We have introduced already a few improvements. We no longer display certifications for releases that have expired their maintenance window. The aim is to de-clutter the page, so it is easier find the information that you are looking for. You will notice that some of the certified systems have the label “(with notes)” next to their entries. This is a shout-out that some limitations where found while testing that system. Although we deemed those limitations not to be substantial enough to fail certification, nevertheless we want to make sure you are aware of them. Finally, we have also fixed an usability problem where a model had repeated entries in the certified list. We are going to keep working on the Certification web-site’s usability and the data that we are sharing with you . I would like to hear your suggestions on how we can improve. Please add them to this post or raise them as a question in our Launchpad project.